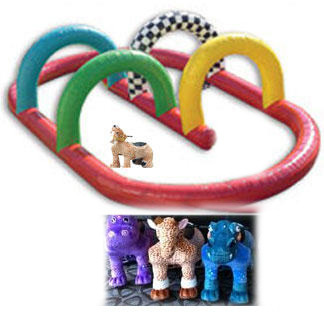 Our Animal Rides provide hours of fun! They are battery operated with a remote control that turns them on. When a preset time ends, the animals turn off and they are ready for the next rider. 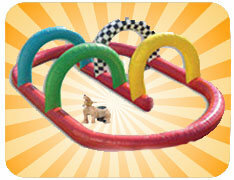 Included is our inflatable track that is 51 feet long by 26 feet deep. Base price is for a 4 hour rental. Additional hours are available at $75.00 per hour. One attended is required to monitor play at all times. This attendant can be someone that you provide, or Parties Inc. can provide an attendant at an additonal cost. Delivery is free within 15 miles of our location, each way. Each additional mile is 75 cents a mile each way. A flat smooth surface that is 53 by 28 feet deep is needed for set up. A 15amp circuit is needed with 75 feet of the set up area.